Director’s Circle donors will also receive invitations to exclusive events, acknowledgment in The Lyric annual magazine, and concierge service at the box office. 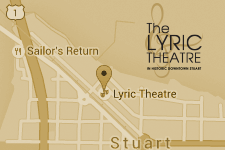 The concierge service puts you in direct touch with The Lyric’s ticketing manager, who will help you to secure the best seats for the shows of your choice. Concierge level advantages include full no-charge cancellation and exchange privileges. Be sure to visit our Patron Perks Providers to redeem your perks and to thank the merchants who support The Lyric Theatre!